I thought I had posted this, but apparently I was wrong. I probably dreamt that I did 🙂 In any case, this piece is about a year old. I haven’t had much time for portraits in the past 7 years or so (and the few ones I did draw weren’t very good), so I was pleasantly surprised I still knew how to draw a portrait – sort of. I do have to say my success partly depends on the quality of the reference photo, and this was an excellent photo. 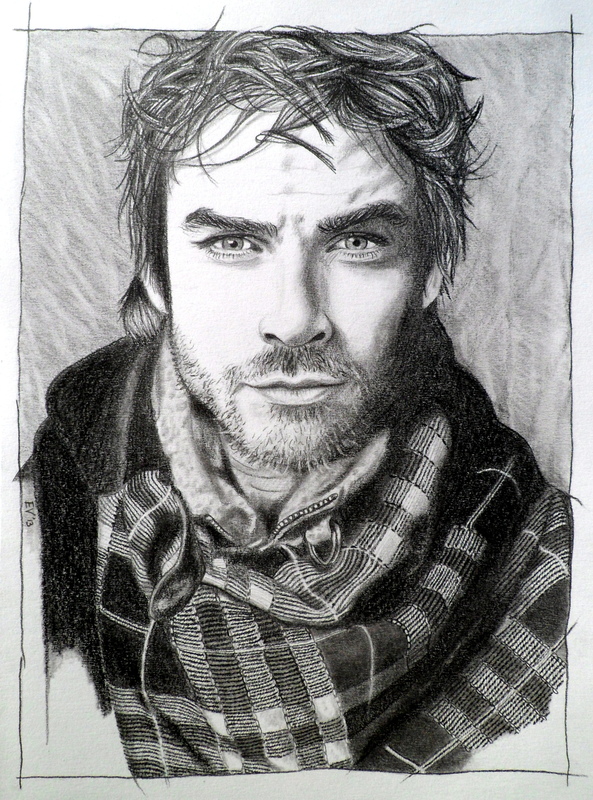 Anyway, I have been intrigued by Ian Somerhalder’s face and his impossible eyes ever since Lost, so I thought it was time to draw him again (I also did a portrait back in those days, but I was just a kid and it’s unsightly :p ). Mr. Somerhalder has this slight, slight misalignment of his eyes, which makes him so very interesting to draw (not sure I managed to capture that so well though). I also enjoyed doing the scarf and all that, I’ve always loved drawing interesting clothes!